The chatbot revolution hit a stumbling block this year after constant hype throughout 2016. 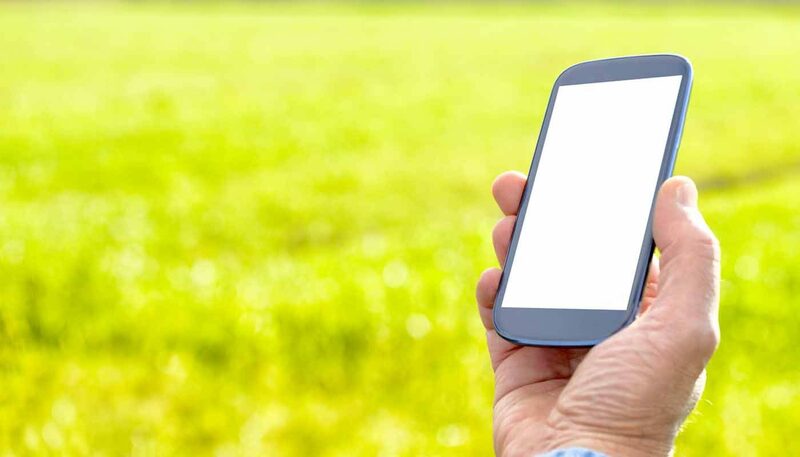 By March this year Marketing Land complained that chatbots have struggled to live up to the hype – a stark contrast to the optimistic headlines going around just months earlier. The Ringer went as far to announce that the chatbot revolution is on hold in April. So what happened? Why are chatbots falling short of expectations when the conversational UIs powering Google Home and Amazon Echo are thriving? Many will say it’s because the current crop of chatbots fail to replicate human conversation convincingly enough – but this isn’t the issue at all. The problem is designers are too worried about human-like interactions when they should be focusing on the entire selling point of conversational UIs: providing a personalised experience for users. Users aren’t interested in how much your bot sounds like a human; they just want to know it’ll help them get things done. So get to the point. Stop trying to be funny and asking what people thought about last night’s episode of EastEnders. Focus on helping people complete tasks faster and making tedious tasks redundant. This is the entire point of conversational UI. 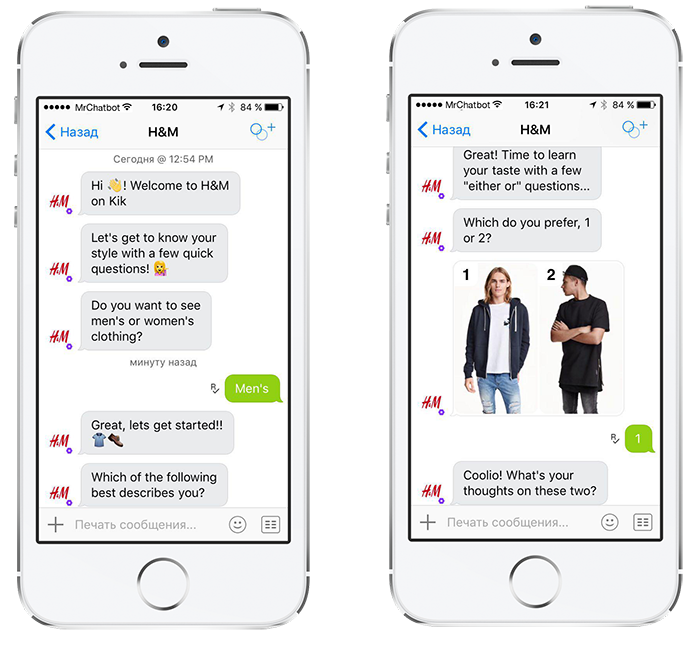 Chatbots have got everything they need to do this, but too many designers get caught up in trying to impress users with how human-like their bots are. This results in bots that don’t help users achieve much of anything they can’t do elsewhere. Instead, designers should focus on creating a personalised experience, based on user data, to reduce the workload between users and conversions. Okay, so I keep talking about the importance of personalisation with conversational UIs, but what problem does personalisation actually solve? Well, practically speaking, it saves users from repeating unnecessary interactions and creates a faster consumer journey with less friction. It also creates a more engaging experience after the conversion to keep users involved with your brand, build stronger relationships and make it harder for them to go elsewhere next time they want to buy. In terms of reducing repetitive tasks for users, we already know this is an important design principle – and we see it all over the web. Shopping sites keep users logged in, record their recent searches and even recommend related products to remove barriers ahead of the next sale. Conversations UIs take this concept a step further by building a walled garden where users are always signed in to everything. They create a single place where users can complete every desired action without leaving the app or repeating unnecessary tasks. 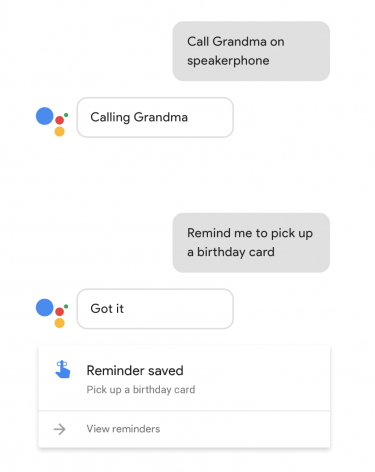 With Google Assistant, you don’t call grandma from the phone app every time you want to speak to her. Likewise, you don’t set reminders in the calendar app every time something comes up. You tell Google what you want to do and it completes the actions for you from inside the same app. Going back to eCommerce, this removal of repetitive tasks (eg: navigating product pages, refining searches, completing payments, etc.) results in a faster conversion process and reduces friction. The less users have to do, the less likely they are to drop off – especially when it comes to mundane tasks they’ve already done time and again. 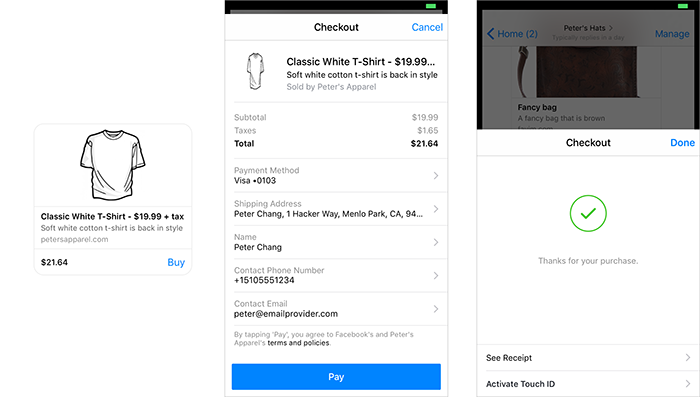 Facebook’s beta payments feature for Messenger bots cut out the payment process for purchases inside the app. Not only does this save users from repeating the payment process for every purchase, it keeps them inside the app which means you can keep engaging with them. Whether you use this opportunity to improve customer service, promote additional purchases or enhance the experience in another way is up to you. The point is, personalisation keeps the experience moving in a way that’s relevant to individual user needs. The end goal is a conversational interface that increases conversions, continues to engage users and encourages them to come back. Now let’s imagine a conversational UI that offers nothing in the way of personalisation. People aren’t going to be excited about the prospect of telling a chatbot the same information every time they use the platform. Asking users about their style preferences is a great way to personalise the chatbot experience, but not if your bot forgets this info the next time this user starts a conversation. Personal details like gender, age, shoe size and delivery addresses should all be remembered for future sessions. Moving beyond that, storing user actions and purchases to build a profile of their preferences is equally important. Over time, you want to be able to recommend products that will genuinely interest users, based on their purchase history. For the end user, the real value of personalisation comes after the first purchase. A travel bot, for example, will have a user’s booking details and be ready to send out reminders and travel updates as they happen. Or let’s say you have a customer waiting for their order to arrive and they’re feeling a little impatient. All it should take is a “Where’s my stuff?” message to your bot and they’ll get a rapid response saying “It was dispatched this morning and should be with you tomorrow!”. With their order details stored, you know what they mean by “Where’s my stuff?” and there’s no need for them to provide any additional info. Conversational UI brings a whole new world of customer service opportunities. You don’t even need to wait until people get in touch to answer their questions. You can send delivery updates directly to their phone, recommend new products, send them the occasional voucher or offer tips on how to get the best from their purchase. One thing to keep in mind with chatbot customer service is that people might want to speak to a human at some point, which brings a new set of UX challenges. First of all, your human staff need to have the knowledge and authority to handle more complex requests. Your bot is there for the simple stuff so what’s the point in speaking to a human for the same tasks? Above all, people are going to be pretty frustrated if your bot fails to deal with their request and then your support team hasn’t got the know-how or ability to help them. Also, make sure your team has access to the same data your bot has. If your chatbot can understand what someone means by “Where’s my stuff?”, it’s a bit of a let down if people have to hand over all their details for your staff to know what they’re talking about. Integration is also important, too. When someone uses a bot to book their flights, why should they jump to another platform to get their hotel room? If you’re not providing the hotel booking service as well, integrate your bot to another one that does. 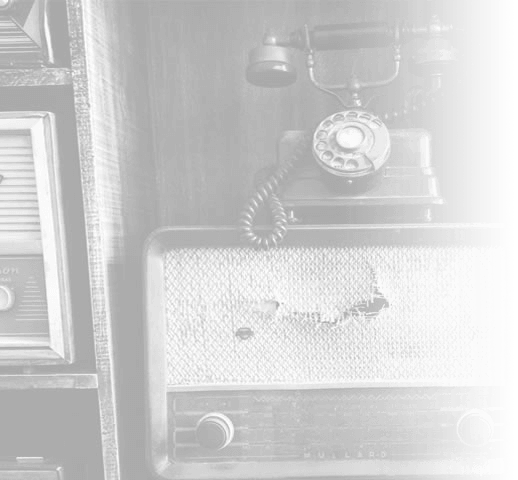 The whole point of a walled garden infrastructure is that users never need to leave – precisely the approach behind Google Home and Amazon Echo. The key for those of us who aren’t Google or Amazon will be integrating with the tech giants to remain discoverable. For example, your bot integrates with Facebook, knows a user has a passion for yoga and just so happens to be in Paris right now. Cue the recommendations for yoga classes in the nearby area. You should also think about integration with devices as well. For example, allowing people to take images from inside your app or sending push notifications when you have a new line of products in. Use the full suite of software and hardware capabilities of devices to full advantage. The whole premise of conversational UI is to reach users on a one-to-one basis. Somewhere between the chatbot hype last year and the design process that followed, this seems to have been forgotten. Yes, the conversation is an important part of the user experience but the priority is making the consumer journey easier and more engaging to complete. Personalisation takes the mundane tasks out of this process for users and builds bots that enhance the customer experience. So remember: the conversation is secondary; conversational UIs mean nothing without personalisation.